PARIS (REUTERS) - Firefighters doused the smoldering ruins of Notre Dame with water on Tuesday (April 16), the morning after a raging inferno swept through the gothic cathedral in the heart of Paris as investigators tried to establish what started the fire. Firefighters who entered the burning cathedral saved many of its treasures, Mr Riester said, although some paintings remained inside and risked smoke and water damage. President Emmanuel Macron promised France would rebuild Notre Dame, considered among the finest examples of French Gothic cathedral architecture and visited by more than 13 million people annually. “We will rebuild it together. It will undoubtedly be part of French destiny and our project for the years to come,” Mr Macron said outside the cathedral shortly before midnight. Two of France’s wealthiest men, Mr Francois-Henri Pinault, chief executive of the Kering group which owns brands including Gucci and Yves Saint Laurent, and Mr Bernard Arnault, the main shareholder of luxury group LVMH, said they would donate €100 million (S$153 million) and €200 million respectively. “This tragedy strikes all the French and beyond all those who are attached to spiritual values,” Mr Pinault said in a statement. A centuries-old crown of thorns made from reeds and gold and the tunic believed to have been worn by Saint Louis, a 13th century king of France, were saved, Notre Dame’s top administrative cleric, Monsignor Patrick Chauvet, said. Mr Macron cancelled an address to the nation that he had been due to give on Monday (April 15) evening in a bid to answer a wave of street protests that has rocked his presidency. Instead, he went to the scene of the blaze with his wife Brigitte and some of his ministers. He thanked and congratulated emergency services and firefighters. German Chancellor Angela Merkel called the cathedral a “symbol of France and our European culture”. British Prime Minister Theresa May said her thoughts were with the French people and emergency services fighting the “terrible blaze”. The mayor of Paris, Ms Anne Hidalgo, said at the scene that some of many artworks that were in the cathedral had been taken out and were being put in safe storage. The cathedral, which dates back to the 12th century, features in Victor Hugo’s classic novel The Hunchback Of Notre Dame. It is a Unesco World Heritage site that attracts millions of tourists every year. 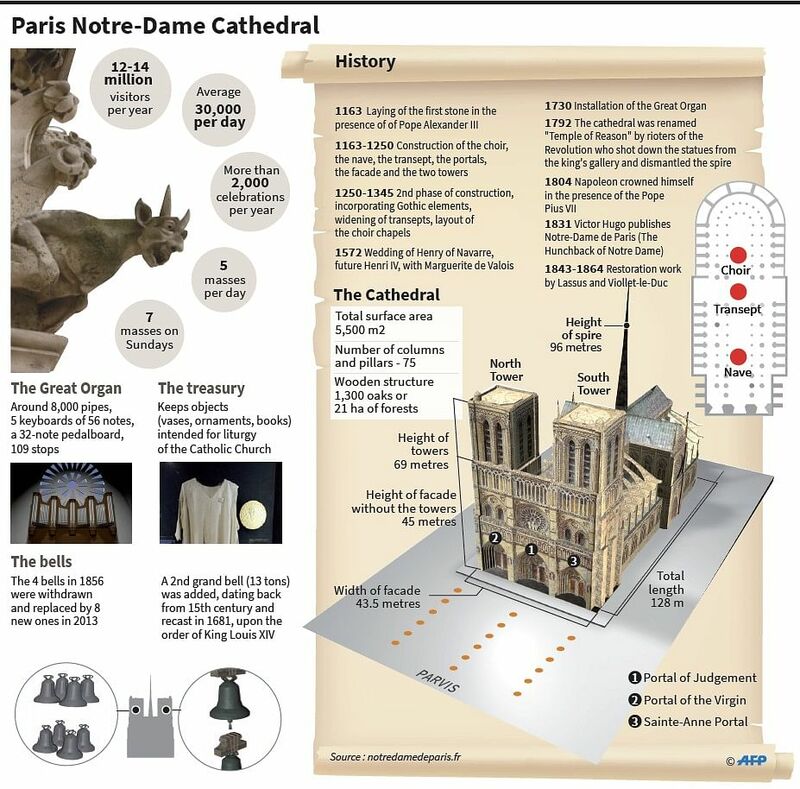 Its 100m-long roof, of which a large section was consumed in the first hour of the blaze, was one of the oldest such structures in Paris, according to the cathedral’s website. A centre of Roman Catholic faith, Notre Dame has also been a target of political upheaval over the centuries.